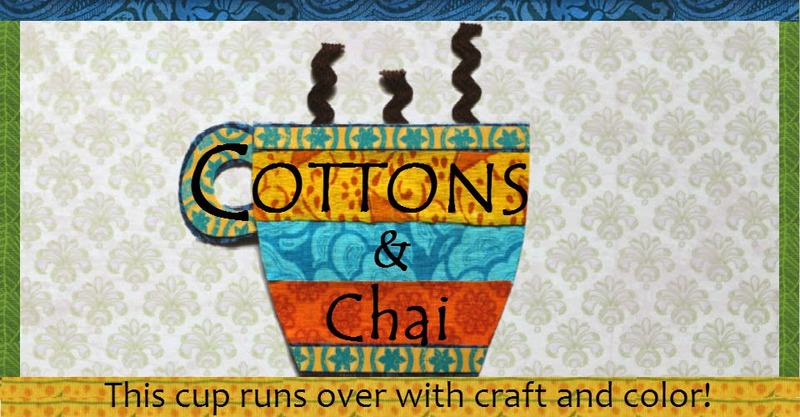 Cottons & Chai: Crochet Beanies for Teenie Weenies! Last week we had our friends over for tea and snacks and it was the unveiling of their brand new 2 month old daughter. Well - at least for us it was, since we saw her for the very first time! It is always great fun to make stuff for babies (even if your project turns out a little less than perfect, they couldn't care less!). That's not the only reason of course - there's so many cute knick-knacks out there to make for tots. But this time instead of sewing something, I decided to dust off my crochet needles that hadn't seen the light of day for a long while. I'm completely a novice crocheter, with just a handful of projects like a couple of butterflies and dishcloths under my belt. But then there is a plethora of helpful youtube videos out there that gives you that experience of actually doing the project with someone right next to you showing you step by step stitches. 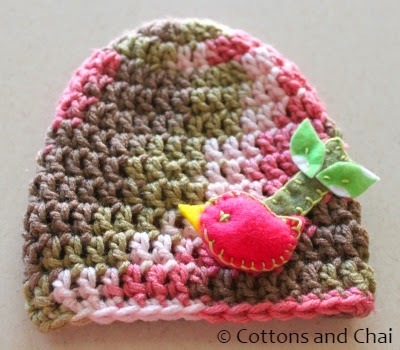 I got hold of one such tutorial by Happy Berry Crochet to make a little beanie for the tiny tot. 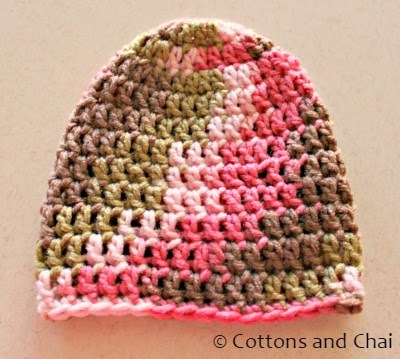 I must say, the tutorial is really clear and although this was the very first crochet hat I made I had no problems with it at all. 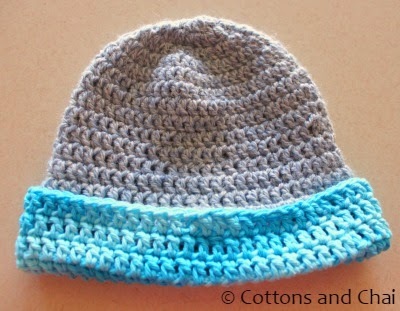 Any fears I had of creating a 'has beenie' instead of a beanie flew out the window once I got started! I used a multicolored yarn from my limited yarn stash and made this. Then of course I had to amp up the cute factor by making some type of embellishment. 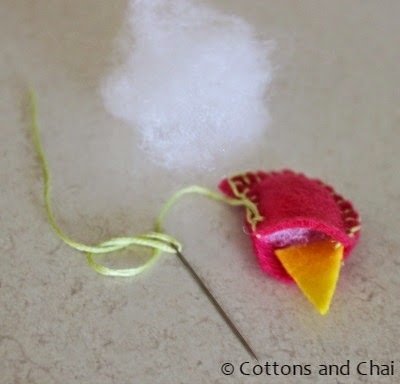 So I cut out the shape of a little birdie from felt, a contrast beak, used some polyfill to plump it up and sewed it shut using a blanket stitch. And here it is sewn on the little hat with a small branch and a couple of leaves! But then by this point I've realized that, crochet is WAY addictive and I also have some blue-grey yarn that Sis has given me earlier. So I went ahead and made him one. I ran out of the yarn a few rounds before I could complete the toddler hat, so I had no choice but to learn how to change the yarn color and continue crocheting haha! Again, youtube came to the rescue by way of this tutorial. I learned that this process was not at all as big a deal as I'd imagined it would be. I fortunately had some contrast yarn in my son's favorite color that went well with the grey. 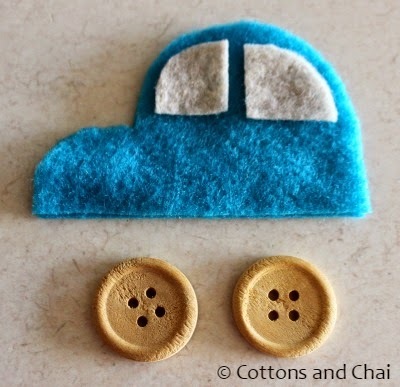 For the embellishment I cut two car shapes out of blue felt and a couple of windows and got two buttons. First I sewed the windows onto one car shape. 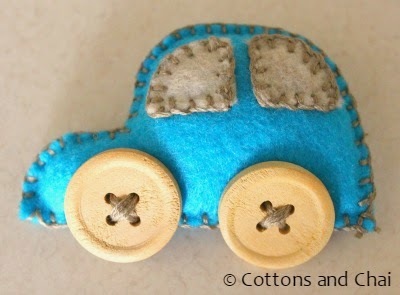 Then sewed the car together with a blanket stitch, filled it with polyfill and lastly added the buttons for wheels. 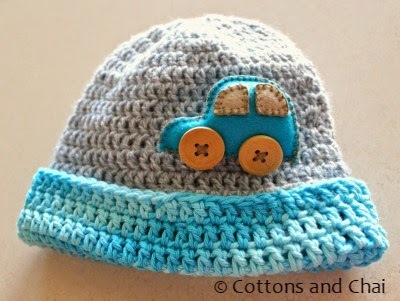 And here's my toddler's beanie! Awwww! 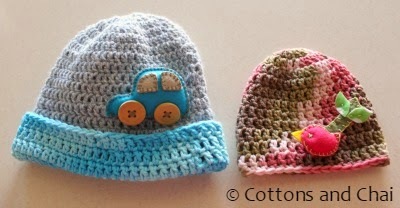 Those two beanies are sooooooo cute! I love the little birdie on the branch and the swanky car. They will look adorable on the two teenie weenies.